Mural - "On the Corner -- On the Square"
Lewistown has a new mural, thanks to Juniata County artist Dwight Kirkland of Blackleaf Studio LLC. He painted it on the side of Wilson’s Gifts and Jewelry Store, owned by Paul Wilson Jr., on Monument Square. Five major, long-lived theatres in Lewistown’s history are represented in the logos across the bottom, and the fronts of three theatres are illustrated. 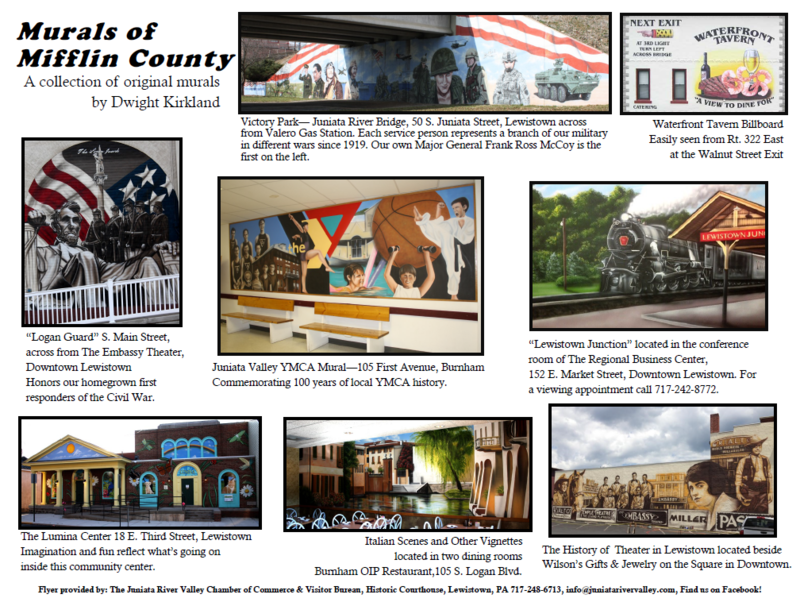 Kirkland donated his time and labor as a gift to the community, and hopes the mural will be enjoyed for many years to come. He encourages everyone who appreciates the mural to make a donation to Friends of the Embassy Theater to help with the theater’s restoration. “If everyone who liked this mural on Facebook donated just $20, it would really add up,” he says. Donations may be sent to: Embassy Theater Restoration Fund, PO Box 203, Burnham PA 17009. Roy Rogers was a popular cowboy movie star in the 1930s and 40s. He and his horse Trigger appeared on the Embassy stage on June 16, 1941. The Miller Theatre was painted from a photo taken on opening night, March 31, 1949. Until 1981, it was a single screen theatre seating 1,200 people. It operates today on West Market Street as Miller Cinema 6. Miller’s longtime manager Bob Hambright is depicted in front of the theatre. His career spanned 53 years, starting as an usher at the Embassy. He also worked briefl y at the Rialto. Hambright passed away in 2003. Temple Theatre (logo at the bottom) was Lewistown’s first theatre. It was located in the Masonic building across the square. It opened as the “Temple Opera House” in 1894. It closed in 1925. The Pastime Theatre (logo at bottom, far right) was a favorite Saturday place for kids. They dubbed it the “Shoot-NJuke” (and other nicknames) because of its western shows. The theater was on Market Street, from 1906 to1953, in part of the building that now houses the Downtown OIP & Grille. Jean Acker was a film star in the late teens and early 1920s. She was married to the “World’s Greatest Screen Lover,” Rudoph Valentino, for a mere 6 hours! During her childhood, she lived in Lewistown, and her father ran the Casino Bowling Alley. 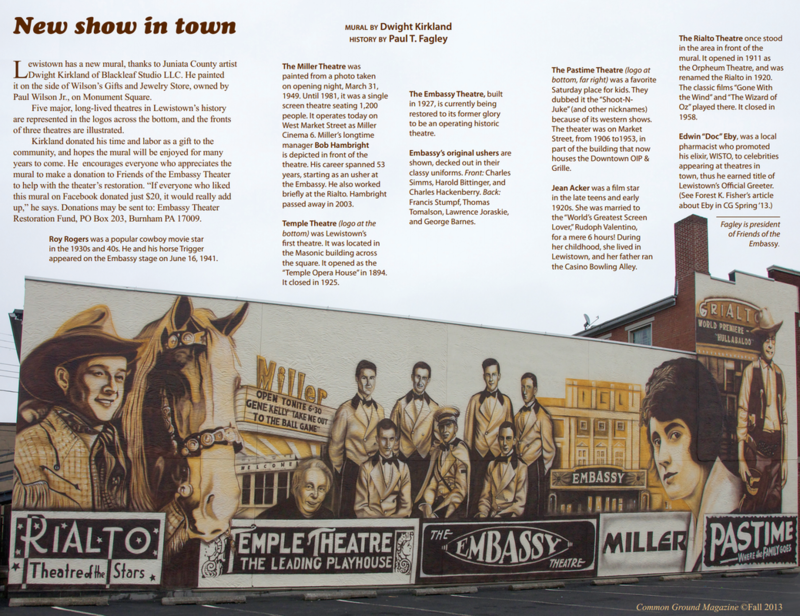 The Rialto Theatre once stood in the area in front of the mural. It opened in 1911 as the Orpheum Theatre, and was renamed the Rialto in 1920. The classic fi lms “Gone With the Wind” and “The Wizard of Oz” played there. It closed in 1958.